Posted on March 20, 2013 by Eric Bonnici wrote in Burgers, East Windsor Restaurants, Featured Pizza and Pizzerias, Pizza and Pizzerias. It has 0 Comment. Slices N’ Squares is a favourite Windsor pizza and burger restaurant. Open late into the night on weekends this hot spot offers a wide range of menu items that go beyond their excellent gourmet specialty pizzas. With over a dozen specialty pizzas available by the slice, or as whole pies in small, medium, or large there’s something tasty for everyone. Examples range from The Classic with bruschetta sauce and feta cheese toppings on a thin crust, to Hawaiian, Vegetarian, Mexican, Meat Lovers, Greek, Chicken Fajita, and Mediterranean. Of course you can build your own master pizza too! In addition, customers can enjoy a wide selection of appetizers, salads, chicken dinners, chicken wings, battered shrimp, oven toasted subs, sirloin burgers, sliders, gyros, poutine, onion rings,and a variety of baked pockets. The baked pockets are golden pizza dough enclosing delicious fillings like pepperoni, spinach and feta, steak, or veggies to name a few. Tasty golden garlic or sugar coated deep fried dough balls are popular. Finish your meal with one of Slices N’ Squares desserts like the amazing deep fried cheese cake. The bright dining area is perfect for a quick bite or to sit and chat with friends. Enjoy the large outdoor patio if you like too. Delivery and catering services are available too. 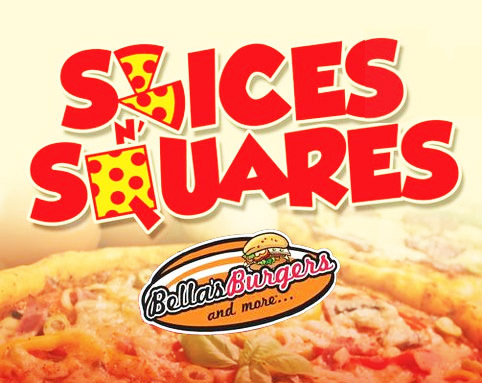 Next time you’re in East Windsor consider enjoying a bite to eat at Slices N’ Squares (Bella’s Burgers and more). Located inside Lauzon Landing, this is a liquor licensed venue.